I don’t yet know how to talk about this. I don’t yet know how to talk about much of anything that is going on inside of me these days. All I know is that something shifted in this 5th month of my new life. I could not have referred to my existence since Carl’s passing as a new life before now. My vision and my heart was too full of death and loss and pain. But, all along, I’ve been praying for guidance and, all along, that guidance has been undeniably constant. I have been praying for God to use me. At the center of those prayers was a desperate plea that He make the loss of Carl and my love for him worth something. But nothing has to be done to give it worth. The value is inherent and, all along, God has known exactly what He is doing. All along…there has been a plan…and I’m in it, Carl’s in it, you’re in it, this little girl, Joy, she is in it. It’s no longer a question of IF God will use me. Instead, I now find myself asking when and where. It is requiring a little bit of patience on my part and, for once in my life, I think I’m ok with that. I sense the depth of where life is taking me and it is not for the fickle hearted. He is preparing me in ways that I cannot yet even fathom. I understand the dangers of rushing ahead and I know my heart will break irreparably if I don’t keep pace with God–whether that means moving forward or holding still. In the coming weeks or months or years, I will probably be sharing a lot more with you about Joy. For now, I just want to introduce you to this little girl who is already changing my heart. That is her tiny little fingerprint on the clay necklace on the right. She is as real as you and me. I want you to know about her so that you might see the way God is working in our lives…mysteriously, beautifully, powerfully, painfully, JOY-fully. I’m going to bring you somewhere beautiful. It is going to be so beautiful that without Me you would feel incredible loneliness–but because of Me you will instead feel peace, you will feel grounded. You will feel connection. Simplify your life to its barest self. You’ll find that you don’t need much. Keep all aspects of life simple so that you will see My way. Where you are meant to go, I will get you there. You are going to find so much happiness that you’re not going to be able to contain it. Every. Single. Step of the way! Live out loud, for others to see. Share it all. Share Me. You will have everything you need, in all ways, to do everything I ask of you. The things I ask of you are the things you’ll want. Trust me. Even when it doesn’t make sense. We are creating space for a certain kind of freedom…a freedom that you’ve never before known and that I promise you will love…you’ll love so far beyond yourself that, someday, when it comes time for you to die away from your physical body, you’ll merely turn into particles of light. You’re love will last long beyond you. I’ll take care of your heart–through it all–just as I always have. Bring it all to me. All of it–both the sadness and the gratitude. You are covered in love. There is an army of angels protecting you. You will be able to go absolutely anywhere without fear. You will go places where other people do not. You will build a family and it will be brighter and more love filled than you can even imagine! Your world will look much more different than the one now before you. Dear Abba, yes…I am yours. I don’t know where you will take me in this life. But I trust you. With my whole heart. I’m in. 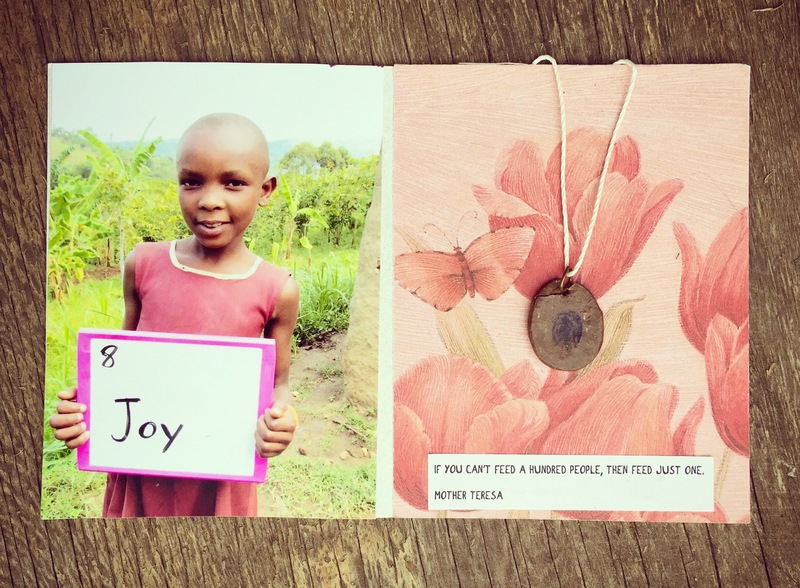 Posted on April 22, 2015 April 22, 2015 by jessiemarianiello	This entry was posted in faith, God, grief, healing, hope, joy and tagged africa, faith, god, grief, hope, journeys, joy, purpose, uganda. Bookmark the permalink. Wow Jessie. I am honored that you are sharing. My heart pounds when I read your words so I know I’m excited for you and that I’m so intrigued by how God is working in your life. Awestruck actually. Love to you. Thank you, Jean. I feel the same, actually. Heart pounding, excited, intrigued, awestruck. I love you, dear friend. Dear little Jessie I am so proud of you. You have always had a loving heart. What an exciting journey God has planned for you and your Carl has been and will continue to be part of it because he is part of who you are now.